Sitzman was born in Cincinnati but received his artistic education in Indianapolis; he is recognized primarily as a Hoosier artist. 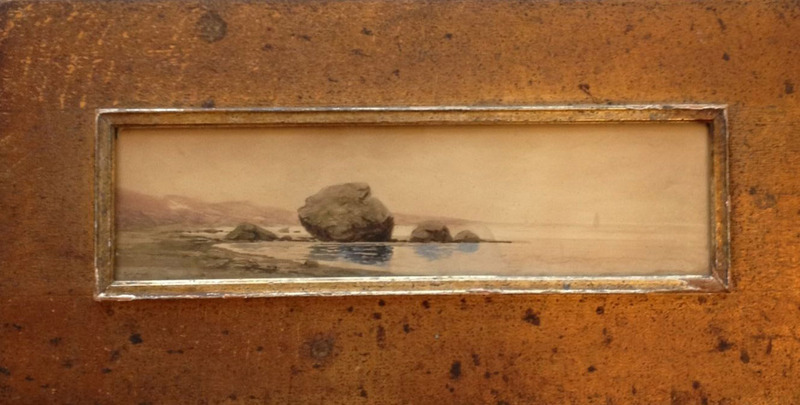 This diminutive watercolor titled “Sentinel” must have been done during a visit to the East Coast, however, possibly in New England where such granite behemoths are commonplace. The presence of galleries in Agincourt was sporadic before WWII. More likely sources were the furnishing departments of great 19th century department stores in Des Moines, Omaha and St Louis. This was acquired from the Younker Brothers Department Store in Des Moines. Their former building was listed on the National Register in 2010 but was destroyed by fire in 2014 during renovation. By agincourtiowa in Landscapes & Livestock on Thursday/05/June/2014 .